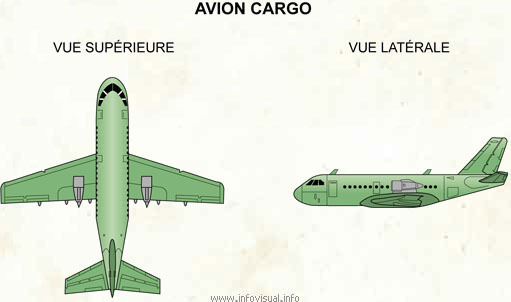 Avion cargo - Dictionnaire Visuel - Copyright © 2005-2016 - Tous droits réservés. [img]https://infovisual.info//storage/app/media/05/img_fr/085 Avion cargo.jpg[/img] [url=https://infovisual.info/fr][/url] - [url=http://www.infovisual.info/]Dictionnaire Visuel[/url] - Copyright © 2005-2016 - Tous droits réservés. Avion cargo: avion transportant des marchandises. A fixed-wing aireplane is a heavier-than-air craft where movement of the wings in relation to the airplane is not used to generate lift. The term is used to distinguish from rotary-wing aircraft, or ornithopters, where the movement of the wing surfaces relative to the aircraft generates lift. Modern jet transport aireplane take off at roughly 290 km/h, and cruise at over 892 km/h.